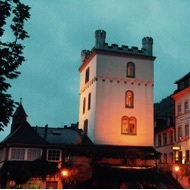 The tower was build in the 13th Century to protect the way to Mainz. 1485 - 1490 it get a upper floor from framework with smal turrets in the corner. 1757 they put off the framework in the upper floor and change that into a Pyramid-Roof. In the year 1990/91 the tower was total restaurated. 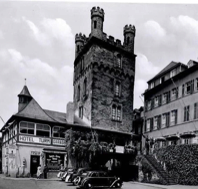 Since 1804 the tower is have been in privat property. The Tower suites are about 60 qms Living Space on 3 Floors with 2 Comfort-Double-Bedrooms, and one Livingroom wirth a smal Coffee- and Winebar, Mulitmedia Area and a smal sofa bed. You can rent our Tower only in a whole, because the sanitary fittings for Guests in the Tower is for all and only ones.